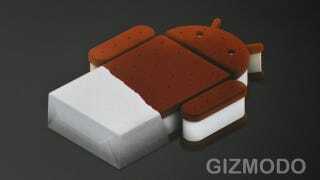 The next Android phone version Ice Cream Sandwich has one clear motive: to put a stop to having dozens (ok, under ten) different versions of Android on devices. Yes, fragmentation. Not just for phones, it's Google's "most ambitious" update yet. There's nothing worse than your friends having a more recent Android version than what you have, and thus getting cool new features. Google said they want "one OS that runs everywhere." They're going to do this by adapting the framework and adding new APIs "to help developers optimize for all various devices." Naturally, they're going to be open source. As a G1 owner, I remember all to well how frustrating it was not having the latest version of Android. Hell, having nothing but Cupcake. Google has signed up "founding parties" of the Open Handset Alliance (that is, all the hardware manufacturers that create products using Android), and made them promise that all new devices must be capable of running the latest versions of Android, for the first 18 months after they go on sale. This is great news, and a really positive step forward for Google. But what about the old devices? Yes, handsets must be able to handle Android updates for 18 months, but that doesn't necessarily mean that phones with custom skins will get updates as they hit. Andy Rubins said during a Q&A at Google IO that it's something they're still figuring out. Unlike Honeycomb, which Google says was not made open source as they worked to unify the Android OS for various devices and form factors, Ice Cream Sandwich will be open sourced for developers to do as they please with. Everyone's going 3D! So it makes sense Google wants in on the action too; albeit in a different way to most. Ice Cream Sandwich is going to use OpenGL headtracking, so it can track the user's facial features—your eyes, two noses, big smile grin and so on—and kind of like the Kinect, the device will replicate what the user is seeing. It's very difficult to explain, so you should check out the videos below for a proper demo of the feature. Google's going down the maker route with the Android Open Accessory feature, which is a set of APIs that let third-party devices, such as your bike, actually sync up with your 2.3.4 or 3.1 device and send the data both ways. It will use USB for starters, and Bluetooth later, and while you need a compatible app (in the bike's case, they were using the CardioQuest app), you'll be able to write it yourself! Isn't that fun? Yes, it's fun. Unfortunately it's not going to be available until the fourth quarter of this year. Sorry! Have you seen how Google erects big statues outside their HQ for every Android release? Froyo (short of frozen yoghurt) was released May last year, and as it looks like a big squirt of icecream, I suppose Google felt the need to differentiate its product releases, so went down this tasty route instead.